You'd need to pay careful attention to detail to remove a thorn from the paw of a lion. St Jerome certainly had that ability in his scholarship and diligent work of Biblical translation and commentary. It is probably not true that he applied this skill to befriending a lion and removing the thorn from its paw. 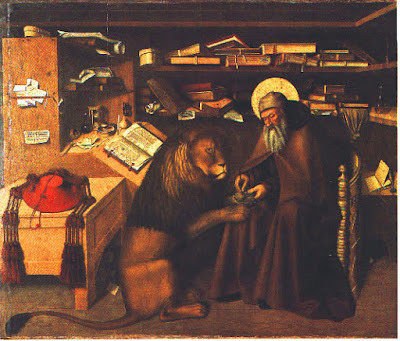 The lion story is a rather charming legend and this 15th century painting by Colantonio of Jerome in his study is fascinating. I love the expression on the face of a lion - almost like that of a worried little boy. The idea of angels is popular today. 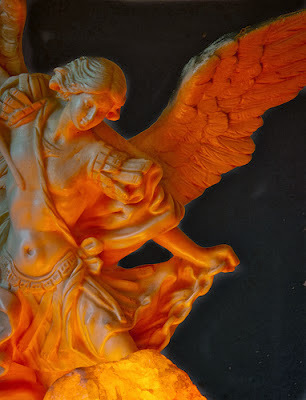 It seems many people who don't have much faith in God are comforted by trust in guardian angels, often of a rather domesticated sentimental variety. I wonder if worship of angels has replace worship of God for some? Today is Michaelmas - the Feast of Michael and All Angels - a feast so popular in England in past times that when other feasts of angels were removed from the Church of England calendar during the Reformation period, Cranmer retained the Feast of Michael and All Angels which falls on 29 September every year. It comes around the turning of the year in the Northern Hemisphere, the end of harvest time when hours of daylight are becoming shorter, autumn is here and winter approaches. It's a good time for a feast. People struggling with poverty and debt might well point accusing fingers at people like Matthew the tax collector. Tax collectors in 1st Century Palestine had ample opportunity to profit by cheating and charging extortionate commission. In this 17th century painting of the Calling of St Matthew by Hendrick ter Brugghen accusing fingers seem absent, although fingers do point from 5 different hands. Matthew's left hand points to his accounts. His right hand points towards himself.The young man at Matthew's left points to a pile of money. 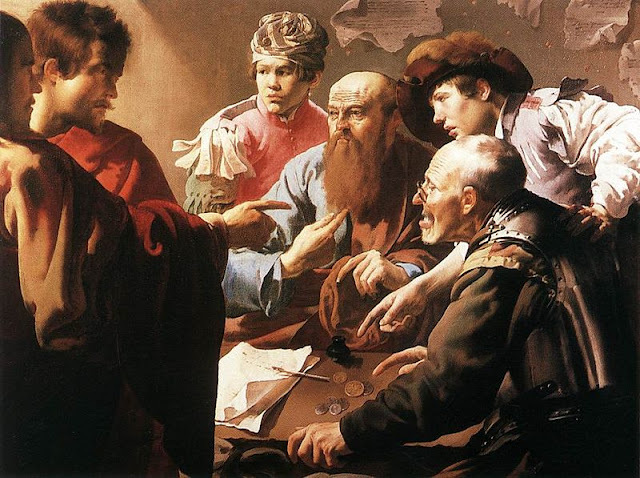 The seated older man points to another pile of money.On the left is Jesus, partly in shadow, pointing directly to Matthew as he and Matthew make eye contact. 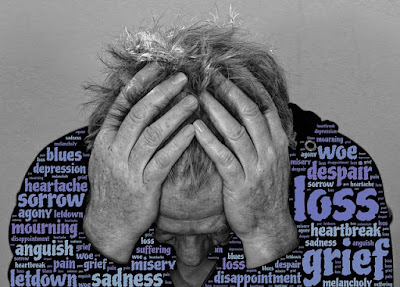 Have Christians lost touch with the language of lament in prayer? 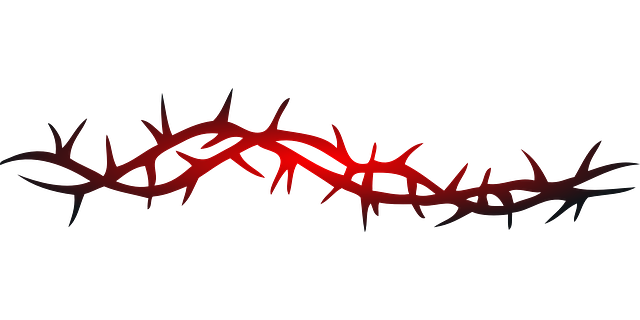 Lamentations is a Biblical book often neglected by UK Christians. I wonder why? Is it because some of us are just too comfortable that we run away from cries of anguish. Is it because we have forgotten the Biblical injunction to mourn with those who mourn and weep with those who weep? The Archbishop of Canterbury has recently invited the 37 Archbishops of the world-wide Anglican Communion to gather in January. "to reflect and pray together concerning the future of the Anglican Communion. "Justin Welby's statement about this invitation is here. Who will actually come? (A similarly meeting in 2011 had significant absentees)Will it be of any value and if so what and how? Some media reactions to Archbishop Justin's initiative have called it a "summons". It is not a summons. It is an invitation. The Archbishop of Canterbury does not have the authority of a pope. In relation to the other Archbishops he is 'primus inter pares' (first among equals) - in other words a symbolic leader. The Anglican Church is not a global institution with corporate governance. Each province operates independently and is loosely linked as a Communion. 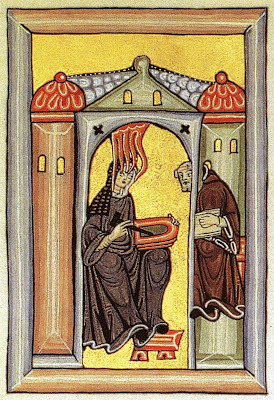 Hildegard of Bingen (1089 - 1179) was a remarkable 12th century woman. For Anglicans and Catholics 17th September is her special day. As the 10th child of her family with fragile health Hildegard was placed in the care of her reclusive aunt Jetta. Jetta formed a monastic community and when she died Hildegard became its prioress. Hildegard moved this community of nuns to Bingen on the Rhine river in what is now Germany. Later she established another convent at Eibingen near the town of Rüdesheim am Rhein. There is a Benedictine Abbey there now on that site. It is in a beautiful position high on the hillside overlooking the Rhine and surrounded by vineyards. I just got a glimpse of it last year and that visit got me interested in finding out more about Hildegard. A Segment or the Whole? I like apples. I don't like the way they quickly discolour when you cut one up. 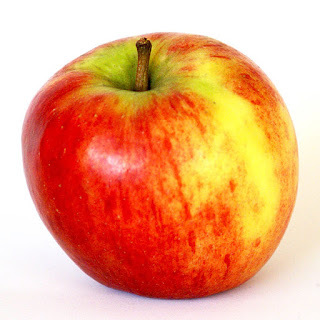 If you are sharing food at a picnic it is better to give the whole apple to someone and not try to keep pieces back for yourself. Even if you did think to bring a knife. Mandarin oranges are different from apples. 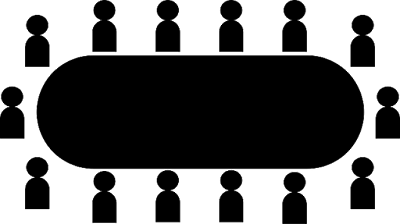 They divide easily into segments. They are good for sharing at picnics or for savouring slowly, one segment at a time. If I have an orange I can choose to give someone else just one segment if I'm mean, more if I'm more generous. Back in May this year, during a retreat in the Galilee region of Israel, Bishop John Pritchard took our group to the archaeological site of ancient Caesarea Philippi. It is at one of the sources of the Jordan River at the foot of Mount Hermon. This is the place where Jesus asked his disciples his crucial question, 'who do you say that I am?' (See Mark 8: 27 - 38 for one version of the story). 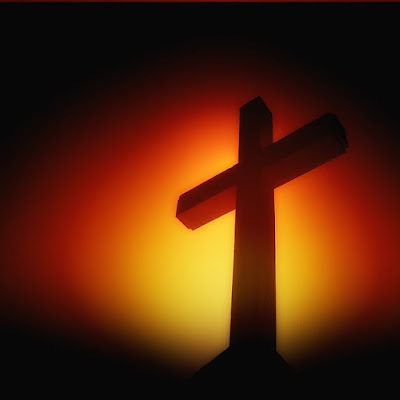 Why is Holy Cross Day on 14th September, not Good Friday? The tradition goes back to the 4th century and the pilgrimage to Jerusalem made by Helena, mother of the Emperor Constantine. She went there after her son and his empire had adopted Christianity. She wanted to find and preserve sites associated with Jesus. One of the sites that was identified for Helena by local people was the area just outside the ancient city wall of Jerusalem that had become traditionally associated with the crucifixion, burial and resurrection of Jesus which took place 3 centuries earlier. 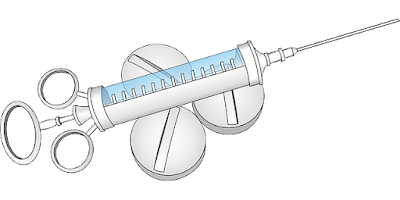 The 'Assisted Dying (No. 2) Bill' has its 2nd reading in the House of Commons today. This is "a bill to enable competent adults who are terminally ill to choose to be provided with medically supervised assistance to end their own life." You can read its full text here. I write this as the debate in the Commons is going on. I hope it will be defeated. I have many reasons which I will not go into in this post. Some of them you can find in this Guardian article and on the Church of England website. My main reason for being against a change in the law on this matter is based on the Christian imperative to have compassion and to care for the vulnerable. I want our medical and care services to develop excellent, properly funded and resourced palliative care for all who need it rather than enabling assisted suicide in a few rather difficult to define situations for people who may have despaired of such good care being available. "The King has died. 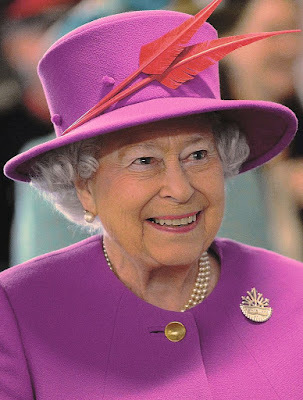 "We must also have been told that Princess Elizabeth would now be Queen, but I don't remember that. Or perhaps we weren't - the Accession Council did not meet until 5 pm that afternoon. Perhaps our head teacher was carefully observing protocol before the official proclamation, although the succession was not in doubt. I do remember we were told to expect grown-ups to be feeling upset and if we passed shops on our way home from school we would find them to be closed. When someone's birth date is unknown and that person is significant then designating a 'birthday' seems like a good idea. It doesn't matter that the 'birthday' chosen isn't the 'real' one when you simply want to celebrate someone's life and all it means to you. Isn't that what birthdays are for? So we have 25th December for the birth of Jesus of Nazareth when no-one knows what day of what month Jesus was born and even the year is subject to scholarly argument. 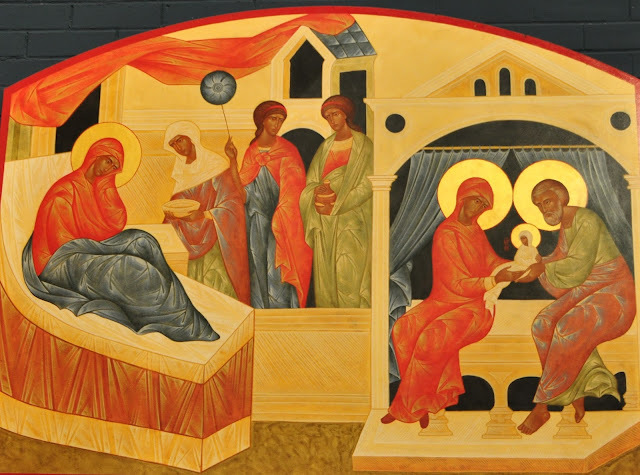 Similarly the fact that Catholic, Eastern Orthodox and many Anglican churches celebrate 'The Birth of the Blessed Virgin Mary' today, 8th September, doesn't mean she was born that day. The date was probably chosen because it was the beginning of the Byzantine year and the Eastern Orthodox liturgical year. The traditional festival began in Jerusalem in the 5th century and was adopted in the Roman church in the 6th/7th centuries. "I was a stranger and you did not welcome me." I was afraid and you provided no security. I was homeless and you gave me no shelter. I was tired and you gave me no rest. I was drowning and you did not hear my cry. I was suffocating and you left me with no air. I was a refugee but you closed your border. "As the master grew old and infirm, the disciples begged him not to die.Said the master, “If I did not go, how would you ever see?”“What is it we fail to see when you are with us?” they asked. But the master would not say.When the moment of his death was near, they said, “What is it we will see when you are gone?”With a twinkle in his eye, the master said, “All I did was sit on the riverbank handing out river water. 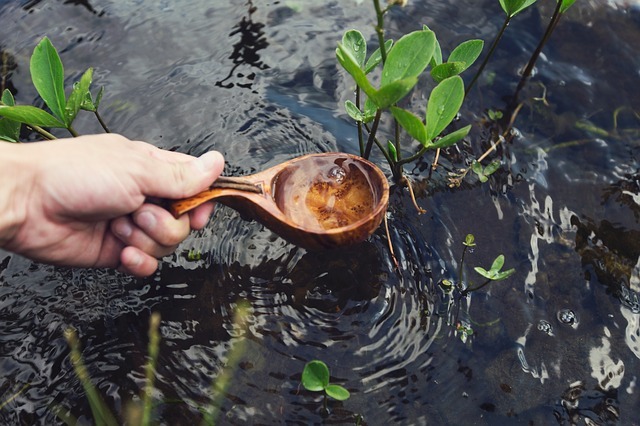 After I’m gone, I trust you will notice the river.”I could point up the moral of this story or give you my interpretation, but often it is better to let a story speak for itself. I wonder what it says to you? I've recently returned from 3 weeks in South Africa. One of the things that made an impression on me was the personal service we received in places like shops, restaurants, petrol stations. 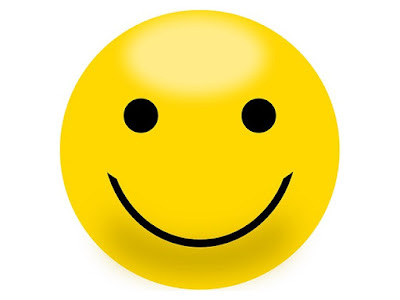 While not universally good, mostly it was friendly, helpful and enabled us as customers to feel cared for and special. Some people have the gift of cheering the spirits of others. The voice of the cynic in me said that if wages are low then customer tips are important and providing excellent service helps ensure a good tip. Whether or not that was the motivation for some, the people offering the service still provided a positive experience for the customer. At home in the UK the customer experience varies enormously. However there is one supermarket where I regularly shop partly because I know the experience will be positive, the staff are courteous, helpful and will go the extra mile when needed. And they don't expect to be tipped! September 1st - the first day of spring in South Africa - the 1st day of Autumn in the UK. It is also a day to commemorate Giles of Provence (not to be confused with St Giles of Assissi). The hermit St Giles lived in a cave near Arles in France in the 7th - 8th centuries. Dates are uncertain as are facts about his life. He became a popular medieval saint - patron saint of lepers, cripples, outcasts, nursing mothers and blacksmiths. In medieval paintings he is often shown with his pet hind. 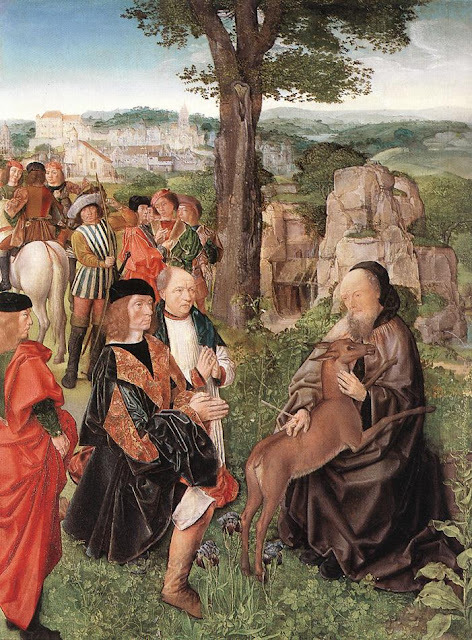 In this painting of c. 1500 by Master of St Gilles, the King kneels before Giles to ask his forgiveness. This was after one of his huntsman had shot an arrow intending to kill an animal but which wounded Giles instead. Or so the legend goes.